The extraordinary range of photography from South Asia dates back to the official birth of the medium— in the mid-19th century. 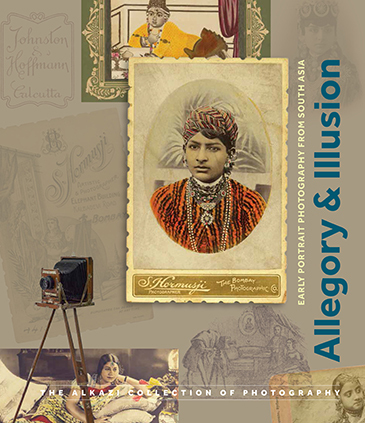 One of the first exhibitions of its kind in North America, ‘Allegory and Illusion’ offers an intimate survey of vintage images from the modern nations of India, Sri Lanka, Burma, and Nepal. Together, they established a unique regional history of photography through both foreign and local practitioners. For this seminal collaboration between the Rubin Museum of Art (New York) and the Alkazi Foundation for the Arts (New Delhi), the photographs have been drawn exclusively from the private collection of Mr. E. Alkazi. As part of his historic photography archive, these images have been curated to explore the linked fields of portraiture, figuration, and inter-visual communication. The three lead essays, together with photographer biographies and techniques, present varied perspectives on photography’s development of a unique vernacular culture. Ethnography, identity, integration, and assimilation are therefore some of the key notions that underlie practices of portraiture and domesticating space—reordering how an image may be perceived in our digital present. Some of the leading photographers and studios presented are Felice Beato, Bourne & Shepherd, Johnston & Hoffmann, Gobind Ram & Oodey Ram, Darogah Abbas Ali, Raja Deen Dayal and Shapur Bhedwar. The conditions under which some of their images were shot express the diverse relationship between political events and photographic practice. However, the curators resist a teleological narrative, taking into account not only the role of the medium and the state of technology but, significantly, photography’s non-linear systems of exchange, circulation and collection. Christopher Pinney is an anthropologist and art historian. He is currently Professor of Anthropology and Visual Culture at University College London. His research interests cover the art and visual culture of South Asia, with a particular focus on the history of photography and chromolithography in India. He has also worked on industrial labour and Dalit goddess possession. Beth Citron is an assistant curator at the Rubin Museum of Art. She completed a PhD on “Contemporary Art in Bombay, 1965–1995” in the History of Art Department at the University of Pennsylvania in 2009. She has contributed to ARTFORUM, ART India, Art journal, and other publications. Rahaab Allana is the Curator of Alkazi Foundation for the Arts and Fellow of the Royal Asiatic Society (London). He is the author of Inherited Spaces, Inhabited Places (a volume on World Heritage Sites, 2005) and guest editor of Marg Volume 61: Aperture and Identity—Early Photography in India (2009) as well as the Lalit Kala Contemporary Journal titled Depth of Field: Photography as Art and Practice in India (2012). He is also the honorary editor and proprietor of India’s first theme-based photography quarterly titled PIX, which recently launched its eighth issue dedicated to contemporary photography in Iran.